Do you love a treasure hunt? Find the clues, track down the treasure. How about hide and seek? Slowly looking behind and under everything, until you find what you are looking for. That’s what Geocaching is. It is a treasure hunt and hide and seek all rolled into one. The best part? It’s everywhere. 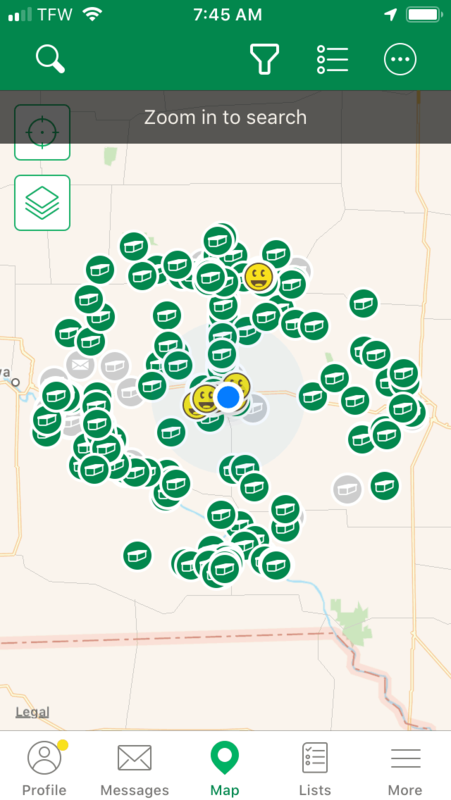 We live in a small town in Iowa and this is what the geocaching map looks like for about a 30-mile radius in our area. As you can see we have a lot of geocaches we can find even in our part of the country. Geocaching is where someone hides a cache and leaves the coordinates on a map. You go look for it. When you find it, there is usually a log to leave your name and date. You put it back so another geocacher can find it another day. There are varying degrees and sizes of caches making it easy for beginners and harder for the more experienced. Register on the Geocaching site to get started. You can download their app to help locate and log the caches you find. It comes in handy when you are at a different place from home, you can just open it up and find caches near you. 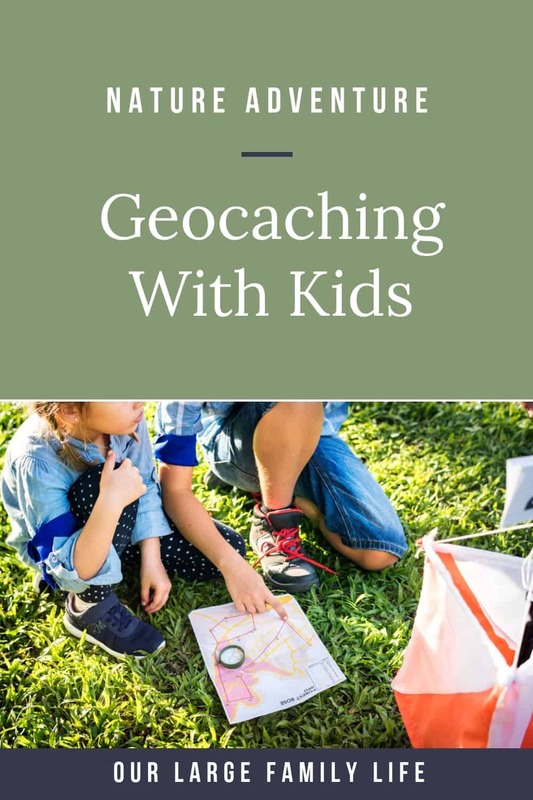 Geocaching can be a really fun activity to do with kids. Our family loves going in search of new caches, but there can definitely be some difficulties. If you’ve never gone geocaching before it can seem a little bit daunting, like “what in the world am I looking for” since a cache can be pretty much any shape and size. If at all possible try finding a cache by yourself so you get the feel of it. It can get frustrating for kids when it can’t be found right away. Pick a cache that doesn’t require you to walk very far. This way kids won’t burn out on the walk and will be more willing to put in the effort. There are caches that are labeled park and grab, which means you can park your car there and it shouldn’t be very far. Geocaching is a great way to get out and enjoy nature with kids. It gets you to explore areas you maybe never would have. State and county parks are great places to go because there are more in an area. So if you are feeling adventurous, pack a lunch and spend the day at a local park hunting geocaches. While geocaching is a great activity for the whole family, here are some tips I’ve picked up the hard way. Pick geocaches that don’t require too much walking. Some caches can be quite the trek from where you park/live. Especially when you starting, it may be best to save their energy for the searching of the geocache. As you continue to successfully find caches your kids will be more likely to keep their energy up for searching. Pick caches that are close to the path. While searching all over in the woods can be an adventure, trying to get little kids to walk through their can be a pain. If you’ve got little kids that are riding in a stroller, going through the woods will be super frustrating. Park and grab caches would be perfect if you have really little ones still needing a stroller. The caches usually tell you how accessible they are, so check before you start hunting. Some caches can be far off of paths = tall grass = ticks. Usually, the app will tell you if you are going into a place that has them. But if you are going to find it off of a trail, it’s best to be prepared because let’s be honest, they can be anywhere. I’d recommend putting it on anytime you are deciding to go, especially if it’s in a park. If you are hiking on a trail, remember water. Snacks are also good to keep younger kids entertained while the older kids search. They also come in handy if you find a place that as multiple caches that you want to find. The geocaching app is so nice for finding caches. Make sure your phone is charged as you use it for searching and looking up the details of the cache. My kids love taking turns holding the phone and leading the way. Make sure your phone also has a protector case in case it gets dropped. Encourage kids to look around/under/on existing structures. Caches can be anywhere. Most of the ones we have found were magnetic and sticking to a structure. Encourage them to turn things over, look under stuff, try moving things to see if the cache is magnetic. Pay attention to clues and past people experiences. The app will give you the name of the cache, which is usually a clue. It will give you a description, and a hint. If you are having trouble finding the cache, another good thing to check out is the activity log. You can see if other people were having trouble finding it as well. If I see other people are having trouble finding it, it could mean that someone took the cache or moved it without it being updated or it’s been destroyed. Geocaching is real-world treasure hunting. You have a map and a clue. You can participate almost anywhere as there are caches hidden all over the world. When starting with children it’s best to search for an easy-to-find cache. This means an easy to access location and a more traditional cache instead of micro. 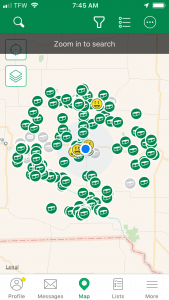 This will allow everyone to get a feel for how geocaching works and what to look for when searching. Make sure to bring plenty of water and snacks, and dress for the excursion: bug spray, hats, sunblock, and maybe long pants if you know you will be in the woods a lot. Geocaching is a great way to get the whole family out in nature. It is also a lot of fun. It’s a great activity to do for the whole day or when you have a few minutes. Where are your favorite places to geocache?